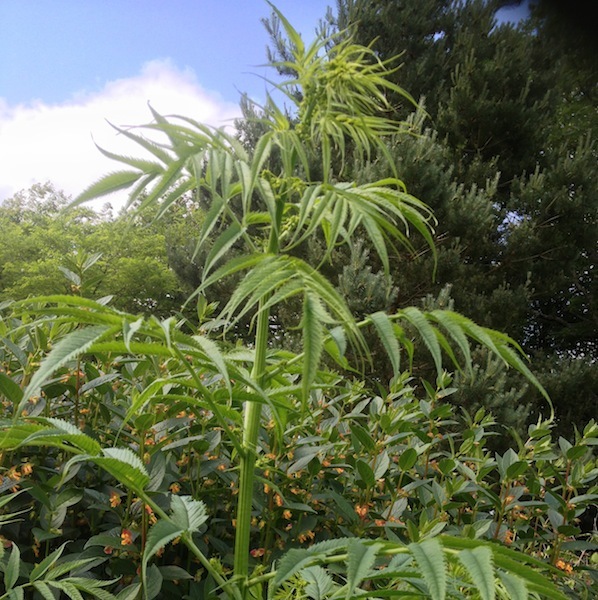 Quite an incredible plant for the back of the border.Tall, strong, fabulous, arching, cane-like stems sprout large, pendulous, terminal sprays of creamy-yellow-green flowers, and are clad in palmate leaves resembling, er… cannabis.. apparently! 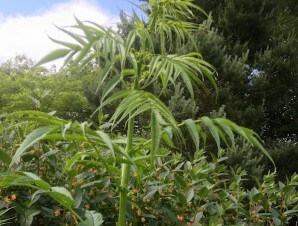 This is perhaps the tallest herbaceous perennial you can grow, and is yet another reliable “baffle-the-expert” plant. Categories: A-D, Autumn, Featured Plants, Plants A-Z, Plants by Season, Plants In Situ, Summer, The Hot Border, The Smoking Border. Stout stems, clothed in attractive pinnate foliage, arch over at the tips, weighted by long strings of tiny green flowers forming graceful fringes in late summer. An elegant foliage plant to be used as a feature plant in retentive soil, or rising above low ground cover.